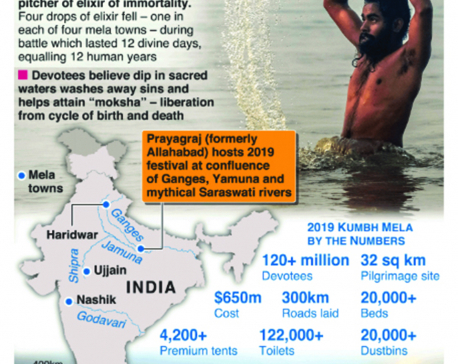 PRAYAGRAJ, Feb 8: At the world’s biggest religious festival, the Hindu Kumbh Mela in northern India’s Uttar Pradesh state, the spiritual message for the faithful is deep and profound. The political message for voters isn’t far behind. 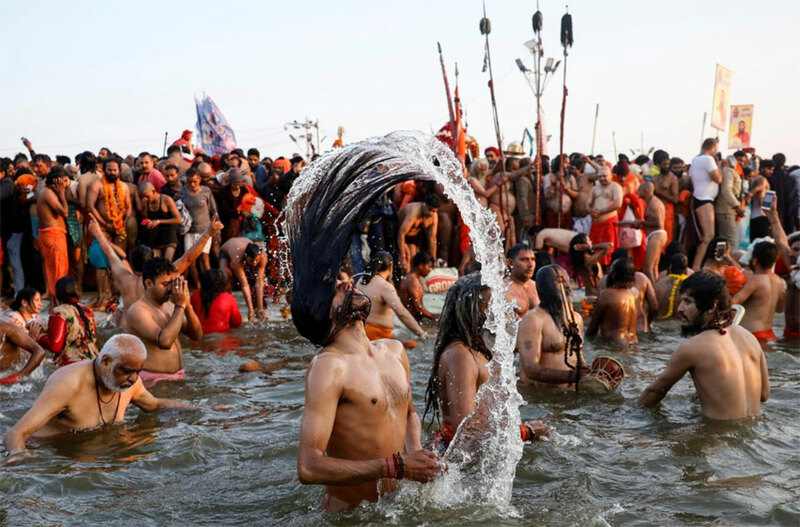 As many as 150 million people are expected to come to the festival city of Prayagraj to bathe at the confluence of three rivers considered holy in Hinduism - the Ganges, the Yamuna, and a mythological third one, the Saraswati. Hindus believe bathing in the Ganges at the time of the Kumbh, this year from Jan. 15 to March 31, absolves people of sins. The federal and Uttar Pradesh state governments - both controlled by Prime Minister Narendra Modi’s ruling Hindu nationalist Bharatiya Janata Party (BJP) - are spending nearly $600 million on the giant event, according to the state government. Some Hindu religious and political figures say they expect a return on their efforts, not only from the gods, but from voters when Modi battles for a second term in an election that must be held by May. Hindu activists are also using the event to build support for a hugely controversial project to construct a Hindu temple on the site of the 16th century Babri Mosque that was destroyed by a Hindu mob in 1992. That assault triggered communal riots and led to the deaths of around 2,000 people, many of them Muslim. Shrikant Sharma, a BJP leader and cabinet minister in the Uttar Pradesh government, denied the Kumbh was being used to score political points ahead of the election, and said people wrongly accuse the party of advocating hardline Hindu causes. Uttar Pradesh, India’s most populous state and one of its poorest, is funding two-thirds of the money to provide an “unforgettable pilgrimage experience”. The total cost is more than three times the last Kumbh in 2013. The BJP nearly swept Uttar Pradesh in the last election in 2014, but depressed farm prices, high unemployment and the coming together of two caste-based regional parties have hurt its prospects this year, opinion polls show. A big loss of seats in the state might prevent Modi and the BJP from returning for a second term in New Delhi. Politics was never far away at two conferences at the Kumbh last week. Hindu priests and religious leaders sang praises of Modi and the chief minister of Uttar Pradesh, Yogi Adityanath, for the “best ever” Kumbh. They also called for people to back the BJP to help it build the temple for Lord Ram at the Babri Mosque site in Ayodhya. A powerful Hindu priest, who has no association with the BJP, said from his base at the Kumbh he would lead a group of followers on Feb. 21 to start building the temple, which could violate a court order and raise religious tensions. At another event there, Bhagwat’s colleague Indresh Kumar told Reuters Modi was the “only meritorious” prime ministerial candidate whose party deserved at least two more terms. Critics among Indian historians and Muslim leaders say the actions of the BJP and other Hindu activist groups are a not only a threat to harmony, but put the very nature of India as a secular democracy at stake. They argue Muslims are increasingly being treated as second-class citizens, pointing to the BJP’s plans to give citizenship to non-Muslims from neighboring Muslim-majority countries such as Bangladesh and Pakistan but not to Muslims. S. Irfan Habib, a New Delhi-based historian, said the Kumbh this year was the BJP’s “Hindu India” plan to prop up the country’s majority religion for political benefit. India’s population is 80 percent Hindu and 14.2 percent Muslim. Under India’s constitution following its independence in 1947, all citizens are supposed to be treated equally. 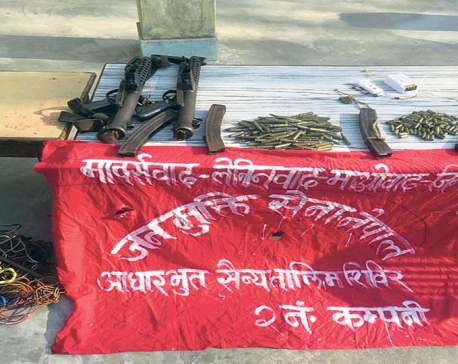 “This is a blatant violation of the ethos which our constitution represents and ethos which were cultivated by our freedom fighters,” said Habib, a specialist in modern history. Governments should stay away from religion, said Habib, who supported the Modi administration’s decision last year to end state aid to Muslims making the annual Islamic haj pilgrimage. At the Kumbh, Modi and Adityanath smile down from hoarding after hoarding, trumpeting the work of their government in Uttar Pradesh. Party workers distributed publicity material to many devotees who attended various religious conferences there. Much of the effort and spending has no overt political tone. Uttar Pradesh authorities have set up temporary bridges, hundreds of mass kitchens, more than 120,000 portable toilets, temporary power stations and arranged thousands of free shuttle buses. Munna, a boatman who has been ferrying devotees for two decades, said his passengers had never been more satisfied at the arrangements than this year, including the provision of free life jackets. He said all of them credited Modi and Adityanath for the cleanliness and facilities. “They are doing so much for us pilgrims,” said Hitu Dambar, a corn and wheat farmer from the central Indian state of Madhya Pradesh, holding a BJP booklet he was handed at a government-backed conference attended by more than 100 Hindu, Buddhist and Jain priests under a massive tent. Adityanath, known for his anti-Muslim rhetoric, started preparing for the Kumbh soon after taking office in 2017 and gave it top priority, officials said. Last October, Adityanath gave the city of the Kumbh the Hindu name Prayagraj, changing it from Allahabad, an Islamic name given to the place hundreds of years ago by India’s then Muslim rulers. He held a cabinet meeting at the festival site late last month, the first such meeting held outside the state capital Lucknow. Pictures on social media after the cabinet meeting showed him and ministerial colleagues bare-chested, bathing in the holy waters and flanked by Hindu priests in saffron. Modi went to Prayagraj in December to inaugurate various Kumbh-related projects. It’s not yet certain if he will visit the Kumbh, said the festival’s officer-in-charge Vijay Kiran Anand. Romila Thapar, 87, one of India’s best known historians, said a “showy” Kumbh like this year’s might help invoke Hindu pride.